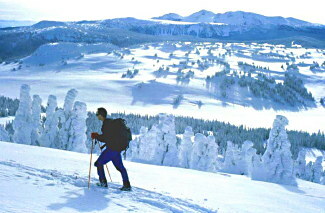 Skiing at Backcountry Ski Lodges in British Columbia. 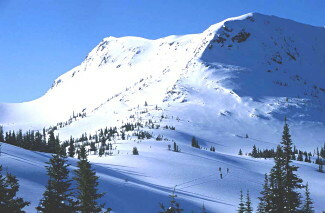 BC Wilderness Backcountry Ski Lodges. View Directory of Lodges . . .
British Columbia is a province built on a tradition of exploration and discovery. And for more than 100 years, backcountry lodges have been a big part of this tradition. Long before there were ski resorts in Canada, before there were even ski lifts, there were those with a strong desire to connect with nature and experience the solitude and tranquillity of BC's majestic mountains. It all started back in the late 1800's when the Canadian Pacific Railway hired mountain guides from Europe to lead clients on skiing expeditions in the mountains of the Selkirk Range. In 1928, Mt. Assiniboine Lodge opened its doors. It was the first lodge in British Columbia dedicated to hiking and backcountry skiing. Today, there are more 25 wilderness lodges around the province, built from the ground up by pioneering spirits who are passionate about the outdoors and who live to share their passion with others. Take part in a whole new world of adventure and inspiration. The silence and purity of exploring BC's virtually unlimited backcountry terrain is a transformational experience. And the friendship, great physical exercise and the exhilaration of backcountry skiing, mountaineering and hiking have made these activities some of the fastest growing sports in North America. And with good reason. The diversity of terrain, the untouched wilderness, spectacular scenery, not to mention the bountiful supply of powder in winter have made British Columbia's mountains world famous. And with more than 25 backcountry ski lodges and providers to choose from, you are guaranteed to find one perfect for you. Most of the backcountry lodges are open year round and are accessed by helicopter, while some are accessible by snowmobile, snowcat, or even by ski or hike-in. Some of them are rustic cabins heated by wood stoves with dorm-style accommodation, and some have central heating, indoor plumbing, and private bedrooms. At some you will be required to bring your own bedding, and at others you will have a private room with a fluffy down duvet and flannel sheets. The key is to check out what is available at each lodge, and then find the one that best suits your preferences and budget. The terrain also varies from lodge to lodge, and each lodge has its own special attraction. Some lodges are geared to experienced backcountry travellers who are looking for steep skiing on big rugged mountains and challenging mountaineering opportunities in the summer. Other lodges offer long fall line cruisers and gentle ski touring across sub-alpine meadows in the winter and easy to moderate alpine hikes in the summer. 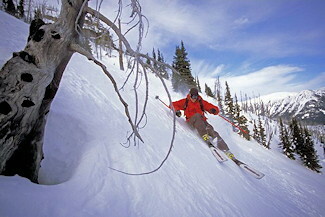 All of the lodges have sub-alpine tree skiing for those overcast and snowy winter days. Most have diverse terrain featuring glaciers and high alpine bowls that will provide amazing ski opportunities for a range of ability levels, and some even offer additional activities like snowshoeing and even cross-country skiing along groomed and track-set trails. In addition, many of British Columbia's backcountry ski operators also offer specialty programs with instruction in nature photography, creative writing, drawing & painting, holistic wellness and much more. No matter the lodge or the season, one thing that is consistent is the quality of the food. Lodge operators know that after a physically rigorous day of activity in the fresh mountain air, the best way to your heart is through your stomach. All of the lodges employ phenomenal cooks; some even have papered Chefs who delight in preparing intricate gastronomic feasts. Regardless of the lodge, rest assured that the food is always good and there is always lots of it. Another thing that all BC's backcountry ski lodges and providers have in common is their commitment to safety. They all offer a professional guiding service, the majority employing guides certified by the Association of Canadian Mountain Guides (A.C.M.G. ), the highest standard of certification available in Canada. In addition to being trained in customer service and nature interpretation, all guides are trained in first aid, avalanche safety, snow stability evaluation, and emergency response. 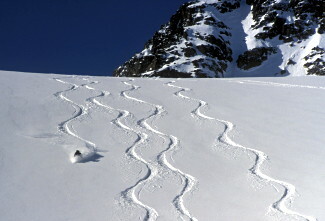 Backcountry recreation, by its very definition, takes place in uncontrolled environments. It is essential to treat the backcountry with respect, and safety is the number one priority of all backcountry lodge operators. Your professional guide knows the lodge's terrain and snow pack intimately; they can help you find the best skiing in the winter and the best hiking in the summer. Your happiness, satisfaction and safety are their business. BC's backcountry offers an unparalleled opportunity to experience Mother Nature in all her glory. 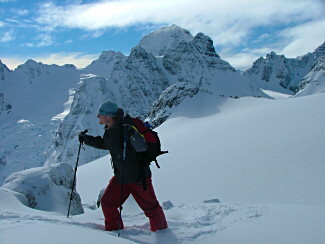 Backcountry skiing is the purest form of skiing and it is a more environmentally sound and much less expensive way of experiencing the backcountry than the mechanized approach. After the snow melts, there is nothing like heading out in the summer to hike along a high alpine ridgeline or through a field bursting with brightly coloured wildflowers to make you appreciate the natural wonder of the mountains. And with so many lodges and operators to choose from, you are guaranteed to find one to suit your needs, your schedule, and your budget.